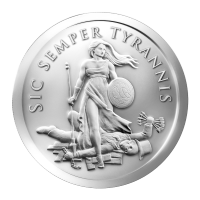 1 oz 2013 Sic Semper Tyrannis Silver Round "Sic Semper Tyrannis", one of the most infamous phrases in US history, was shouted by John Wilkes Booth as he assassinated Abraham Lincoln. 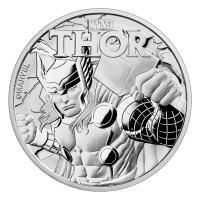 This phrase (Latin for "thus always to tyrants") encircles the obverse of the newest round in the Silver Bullet Silver Shield series, only this time it celebrates the overthrow of the Debt and Death paradigm. 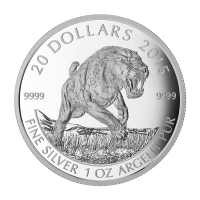 This is the first coin in the series to combine the idea of two coins together. Here, Freedom Girl stands triumphant over Debt and Death. She holds a spear and a buckler shield emblazoned with the trivium, both of which she used to slay Debt and Death with his five arrows from the Rothschild's family crest and the chains he used to enslave mankind. 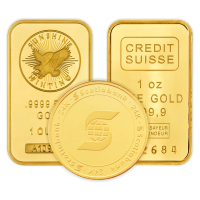 The slain foe lies on a pile of US currency, one of his greatest tools in enslaving humanity. 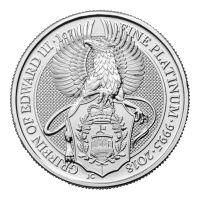 The reverse shows Classic Silver Bullet Silver Shield Crest with the sayings "A Conscious Solution To Collectivist Problems" and "Listen To All. Follow None". 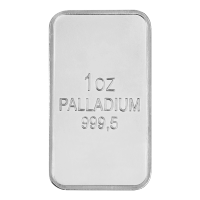 The Silver Shield is flanked by 47 Silver Bullets representing the atomic number of silver. There is also a kite shield superimposed over the bullets and three symbols are etched into it: a key, an arrow and 5 exploding lines.